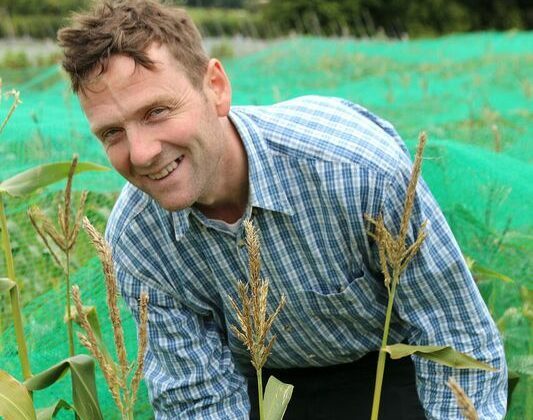 Having grown up on a hilly farm near Keeper Hill, close to Nenagh, Co. Tipperary, Liam Ryan always had a passion for good food and is now growing an array of organic produce on just 5ac. While he initially studied contemporary media practice in London as he was interested in making documentaries, he ended up being drawn back into the story for his love of quality food. That journey brought Liam and his Japanese wife Yuki Kobayashi to a total of 13.5ac at Moyleabbey near the historic Quaker village of Ballitore, Co. Kildare. “I met Yuki in a London restaurant at a birthday party. We shared food. It’s always about food. We lived in England for 13 years. The last two years of my time there I did a two-year apprenticeship in organic farming in east Sussex,” said Liam. “We then decided to move back to Ireland together for simplicity – less travelling – we only had to travel to Japan then and not Ireland too. Yuki came to work in Dublin and I came back to try to get a start in growing here. “I worked for a year at the organic farm in the Dominican Convent in Wicklow, and then I went to set up my own place in Ballitore,” he said. We bought the land in 2003, starting small, but gradually building up experience and doing different markets over the years, but always selling direct to customers through farmers’ markets and our home farm shop. “We have two children, Kai who is 16 and Mimi who is nine. They are both real foodies too. And they are very used to foraging around the farm for tasty things to eat – peas, salad, strawberries, you name it,” said Liam. Yuki runs an acupuncture clinic on the farm and at other locations in Kildare and Carlow and also gives Tai Chi classes. All the produce is grown in a 5ac field. “What we are not actively growing on is kept in green manure ley and we rotate our crops. They sell at their home farm shop every Friday from 12:00pm to 7:00pm and every Saturday at Carlow Farmers’ Market from 9:00am to 2:00pm. They also sell a small amount of wholesale to other growers but this has reduced as direct sales have flourished. That’s what I enjoy the most – meeting people – that connection with the customer. It’s challenging but you get the best price and you have a great connection with customers and community. You get the best feedback. You know what’s working and what isn’t and why. It’s great for fine tuning things. Their own produce has to be supplemented at times. 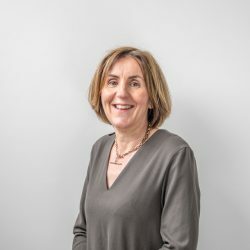 “We manage by working closely with other Irish organic growers. “From June to end of December, it works well in terms of what we grow ourselves. It starts with strawberries and we harvest lots of crops through to December but after that, things get leaner. 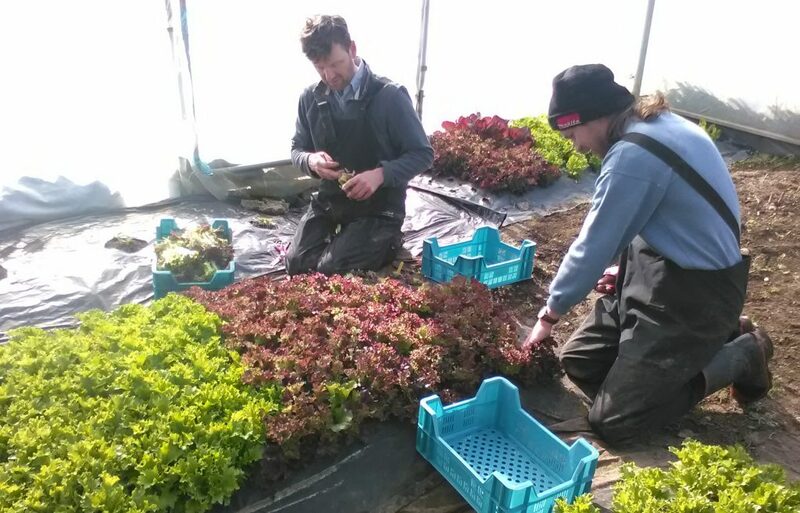 “We can be affected by bad weather too – with more polytunnels you can have a significant amount of salad and spinach say – we are working towards this all the time. One of our strategies is to have more tunnels. “We are working all the time with other Irish growers to provide the widest range of Irish seasonal organic produce all year round. It’s much better than it was, say five years ago, in terms of what’s available. Louise Rankin who did the Organic Growers Internship (OGI) ‘Future Growers’ initiative at Moyleabbey in 2016 and then took on a full-time role on the farm, works alongside Liam on the 5ac plot. “As it’s got busier it’s great to have someone to share all the different aspects with – planning, organising volunteers and the general running of the farm,” said Liam. 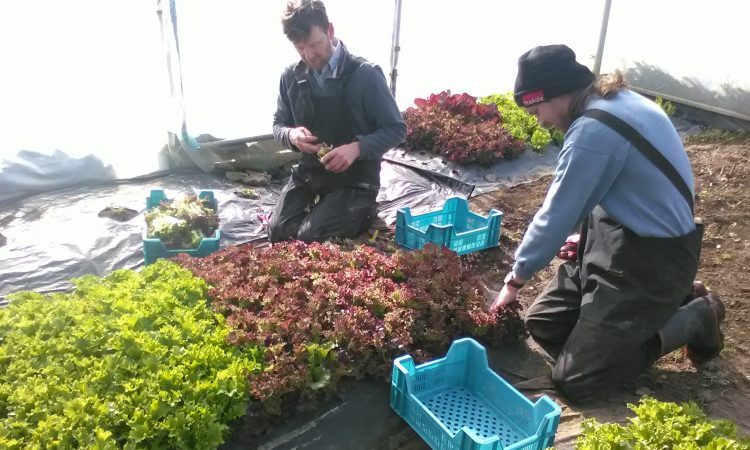 A full-time apprentice, Dagmar, works on the farm as part of the OGI’s ‘Future Growers’ programme. “It’s a great opportunity for people who want to become growers themselves to earn and learn. We work with World Wide Opportunities on Organic Farms (WWOOF) volunteers throughout the year and currently have two WWOOF volunteers from France working with us. “We provide accommodation, food and education in organic farming and living. In return, WWOOFers help us by working on the farm, as a hands-on way of learning and experiencing life as a farmer. Liam, Louise and the team are seeing a growing demand for organic produce and a willingness to pay for it. The general feeling is that there are a significant amount of people who want to pay for and support organic food production. The price isn’t always a priority for them. Most of our customers buy organic for health reasons, but there is also a sizeable number of people who want to support local business and help the environment. 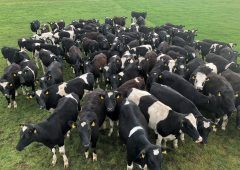 Moyleabbey farm is part of a project with the Irish Organic Association ‘Maximizing Organic Production Systems'( MOPS) which is working to bring together production information from different farms and help coordinate supply and demand. 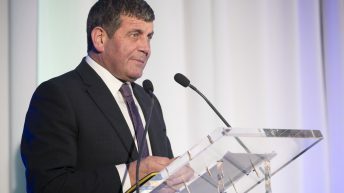 “It will hopefully help us become stronger as a sector and more knowledgeable about what works best,” said Liam.